Q-What is the big deal when it comes to Idaho Potatoes? Idaho grown potatoes have a high solids content, that means there's more potato and less water. The high amount of starch grains cook to a light, fluffy texture. Simply put, these russet potatoes just taste better. Q-What is the benifit of Huge Potatoes? They are great for making curly french fries, long fries, baked potatoes and countless other great recipes. More importantly when you put one of these potatoes on a plate, the look on your friends and family's faces makes these potatoes all so worth it. Q-What is the best way to store Idaho Potatoes? Store Idaho Potatoes in a cool, dark and well ventilated place. They will keep about a week at room temperature and for several weeks at 45 to 50 degrees Fahrenheit. For more information visit the link to the Idaho Potato Commision and go to the faq page. Q-These potatoes are priced higher than smaller ones I can find in local stores. Why should I start buying Huge Idaho Potatoes? One thing you learn in Idaho is that all food is not created equally. Sometimes you can get away with using the "cheap" stuff, but most of the time, if you want a great meal, you have to be willing to do what it takes. There are only so many potatoes grown in Idaho each year. Out of those potatoes there is a very small number of large potatoes grown. These potatoes rarely make it out of Idaho for one reason and one reason only. People in Idaho are a bit greedy when it comes to the good stuff. 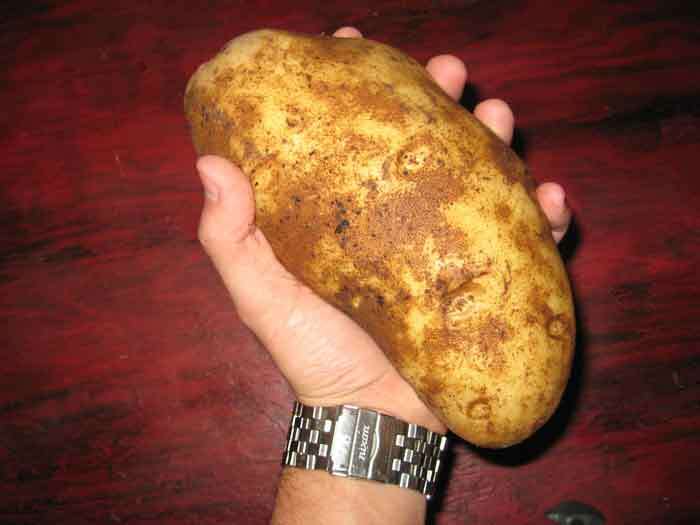 But, thanks to this website, every one in USA can get their hand (or possibly two hands) on a Huge Idaho Potato.